"ENERGY: Airless tire reinvents wheel"
Airless tires could reinvent the wheel for military vehicles by preventing the enemy from shooting out tires. In Iraq, for instance, a leading cause of casualties has been stranded Humvees peppered with small arms fire after roadside bombs blew out their tires. 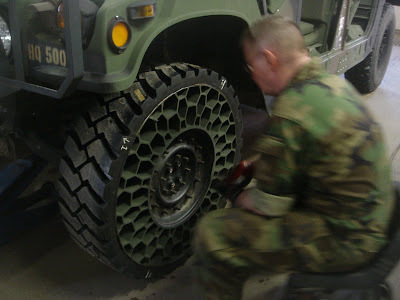 Resilient Technologies LLC (Madison, Wis.), together with the University of Wisconsin's Madison Polymer Engineering Center, are developing an airless tire to solve the problem with a four-year, $18-million grant from the Pentagon. 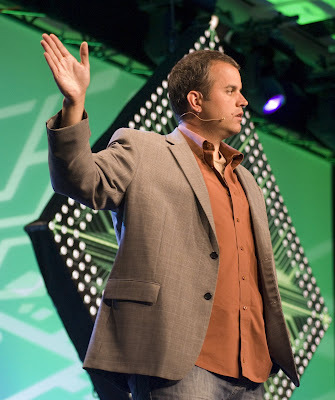 "PODCAST: Week-in-Review, June 27, 2008"
This week my top stories include how Second Life gets a second life, how wireless meshes get easier, how a microcontroller goes wireless, and how a baseband accelerator merges WiMax and LTE. Also get a preview of this weekend's Bourne Report. "SLIDESHOW: Week-in-Review, June 27, 2008"
View a slideshow version of this week's top technology stories, which include how Second Life gets a second life, how wireless meshes get easier, how a microcontroller goes wireless, and how a baseband accelerator merges WiMax and LTE. "MEMS: market tops $6 billion"
The worldwide microelectromechanical systems (MEMS) market topped $6 billion and is growing at a compound annual rate of 14 percent, according to Research and Markets (Dublin, Ireland). Separately, Yole Developpement (Lyon, France) reported that the MEMS market saw record growth among the top 30 MEMS manufacturers, based in part on higher accelerometer sales that were up 300 percent. "CHIPS: Next-generation artificial retina focuses on clinical trials"
A second-generation artificial retina chip called the Argus II Retinal Prosthesis System is beginning clinical trials. The new retina chip was designed at the University of California at Santa Cruz and fabricated by Second Sight Medical Products. The Argus II works by implanting the artificial retina chip directly inside the eye atop the old retina. An array of electrodes stimulates THE optic nerve cells, sending an image to the brain's vision centers. The plasticity of the brain's vision processing capabilities enable it to adapt to the artificially generated signals. A tiny wire connects the artificial retina to a circular antenna mounted around the pupil on the inside front of the eye. A video camera mounted on a pair of eyeglasses wirelessly transmits images to a belt pack containing a microprocessor that processes the video signal, then transmits it to the antenna in the eye, which in turn sends signals down the wire to directly stimulate optic nerves with the implanted electrode array. 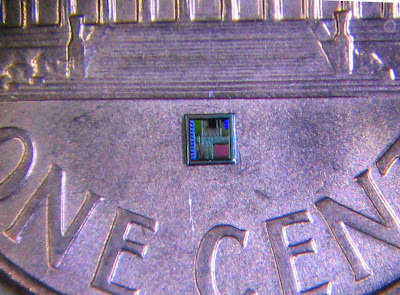 The electrode array was cast using a 1.2-micron CMOS process on a 5.5x5.25 millimeter die consuming 42 milliwatts. It achieves 4-bit resolution for each of the 60 implanted electrodes. Both power and data are supplied to the chip wirelessly. "OPTICS: Excitonic transistor switches optical signals"
Expensive optical-to-electronic-to-optical converters are needed to switch photonic signals. Now, researchers have demonstrated an excitonic transistor that can perform the operation in what they claim is an ultra-small, ultra-low-power and potentially ultra-cheap device. According to researchers at the University of California at San Diego, the excitonic transistor accepts optical signals at its input, converts them to excitons which can be switched electronically, then automatically regenerates the optical signal at its output through recombination. "WIRELESS: Wireless mesh protocol ported to Freescale hardware"
Designing mesh network software for embedded processors using a radio-frequency wireless protocol just got easier for original equipment manufacturers, according to Synapse Inc. (Huntsville, Ala.), which said it has re-hosted its Snap Pro 802.15.4 wireless mesh networking protocol for use on any RF module based on microcontrollers from Freescale Semiconductor Inc. (Austin, Texas). 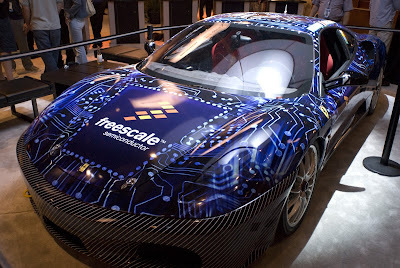 Tapping an embedded virtual machine written in the easy-to-use Python language, Synapse demonstrated that applications could be developed in minutes, instead of weeks, by creating an embedded program during its presentation at the Freescale Technology Forum (FTF), held here June 16-19. "CHIPS: Baseband accelerator merges WiMax, LTE"
"ALGORITHMS: Second Life creator: Virtual worlds achieving real results"
Virtual worlds might seem like kid stuff, but they could end up making big contributions to society, according to Cory Ondrejka, senior vice president of digital strategies at EMI Music, told the Freescale Technology Forum in Orlando, Fla. A co-creator of Second Life, an online virtual world with over 13 millions users, Ondrejka now fancies himself an expert on the technological and social requirements of product development among geographically-dispersed teams. He stressed what he calls the complex interrelationship between innovation and learning, particularly the economic and technological impact of virtual worlds. Second Life users can assume personalities punctuated by avatars and landscapes that mimic public and private institutions in the real world, as well as the social interactions among individuals and peer groups. Ondrejka, who left Second Life in December 2007 and resurfaced this month at EMI, claims his new role there will not be crafting a Second Life clone. However his expertise at virtual worlds remains his forte. Second Life was alternatively viewed as either expanding "Internet addiction" or as a savior of the social fabric in its ability to connect people. Both expectations went tOo far, Ondrejka maintained. "CHIPS: Multimedia developers' task simplified"
Designing consumer electronics multimedia devices for the i.MX applications processor just got easier, according to Freescale Semiconductor Inc. (Austin, Texas), by virtue of a "hardware stack" development kit. 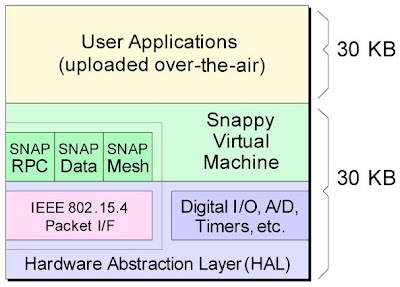 Just as a software stack layers application, network and operating system levels, the i.MX hardware stack divides the prototyping task into three levels: processor, debug and peripherals. 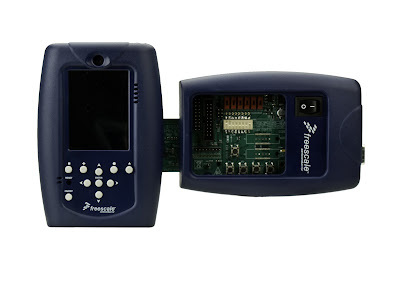 What's unique about the configuration of the i.MX product development kit (PDK) is its ability to remove the middle layer after debugging, so that prototypes can fit into a small form-factor similar to the final consumer-electronics device. 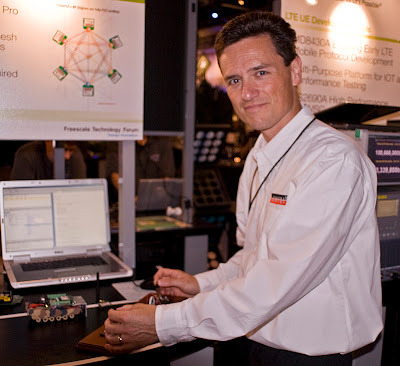 "PODCAST: Week-in-Review, June 20, 2008"
This week our top stories include how Freescale predicts 1,000 embedded devices per person by 2015, how to make an ECG-on-chip, how a picowatt chip sets a new low-power record, how an econo-MEMS chip has no moving parts, and how you can attend the Freescale Technology Forum remotely. Also get a preview of this weekend's Bourne Report. Slideshow to come. "WIRELESS: Freescale wireless chip combines RF, MPU"
In hopes of simplifying wireless-system design, Freescale Semiconductor Inc. has tucked analog radio-frequency components with an ARM7 microcontroller into a single chip it calls a Platform-in-Package. Wireless devices for everything from consumer remote controls to industrial ZigBee network nodes previously had to add the RF components to a circuit board alongside a microcontroller. 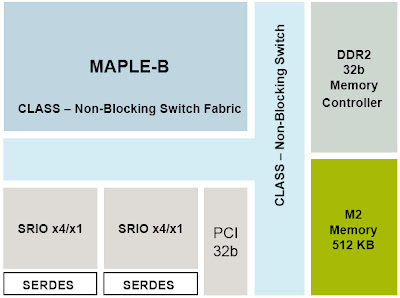 Freescale's MC13224 integrates both. "SLIDESHOW: Freescale Technology Forum Goes Live"
"CHIPS: The future according to Freescale:1,000 embedded devices per person"
In the future, embedded processors with on-chip sensors will dominate the IC business, according to Lisa Su, chief technology officer at Freescale Semiconductor Inc. (Austin, Texas). 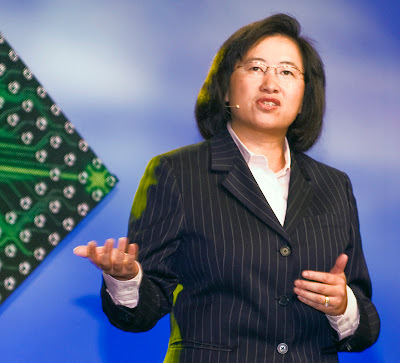 While embedded processors already outnumber those in personal computers today, by 2015 that trend will have redefined the semiconductor industry — away from PC-oriented chip makers [Intel] toward embedded solution providers like Freescale, said Su in her keynote to the Freescale Technology Forum (June 16-19, 2008). Intelligent embedded processing will not be defined by engineering achievements like faster, smaller chips, but by changes in the way people live their lives, said Su. Embedded processing is "being embraced today by almost every segment of society — from children to the eldery." 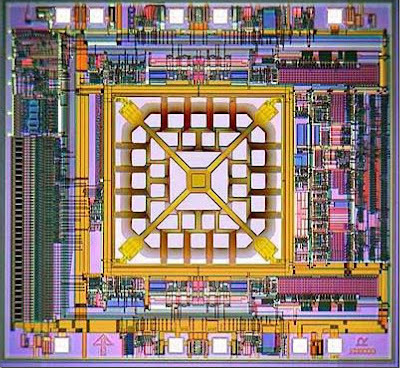 "CHIPS: Picowatt chip sets low-power record"
The world''s lowest-power integrated circuit consumes 10 times less juice when active and better than 30,000 times less power in sleep mode, according to its developers at the University of Michigan. The so-called Phoenix processor was designed for medical implants but could also be used for ultralong-lived environmental monitors and military surveillance, the scientists said at the IEEE Symposium on VLSI Circuits in Honolulu. "MEMS: Econo-MEMS has no moving parts"
Ever since microelectromechanical system (MEMS) accelerometer chips became standard equipment on consumer devices such as the iPhone and Wii, their prices have been plummeting. 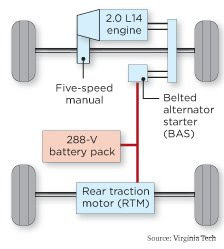 But volume manufacturing is just one reason accelerometers could eventually become $1 devices. 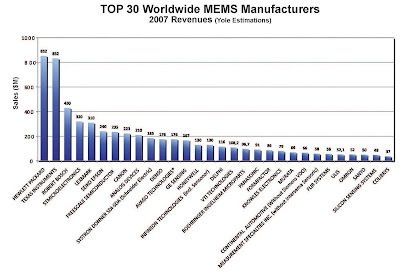 Another is that the most expensive manufacturing-cost components of MEMS—the moving parts—are being eliminated, according to MEMSIC Inc., which has developed a no-moving-parts design (Andover, Mass.). Eliminating the moving mechanical parts means that instead of using an expensive, custom MEMS manufacturing process, MEMSIC can run its accelerometers on any standard CMOS line. 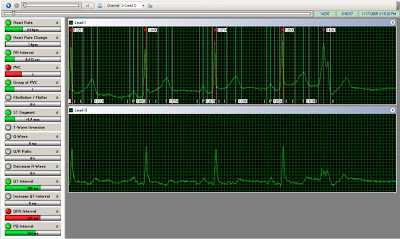 "ALGORITHMS: Embedded software at heart of scalable EKG-on-chip"
A development that's being called the first electrocardiogram-on-chip combines Freescale Semiconductor Inc.'s microcontrollers with embedded software from Monebo Technologies Inc. The companies said Monebo's Kinetic algorithms can be paired with any device in the chip maker's controller line, from 8 to 32 bits, to yield solutions tailored to the requirements of given heart-monitoring applications. The company's algorithms already run on a range of PC and embedded platforms, but the Freescale deal marks Monebo's first effort to market a joint turnkey solution to OEMs. "PODCAST: Week-in-Review, June 13, 2008"
Hear in this podcast R. Colin Johnson review the week's top technology stories as compiled from interviews for EETimes. 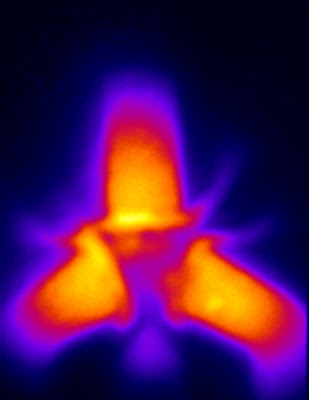 This week the top stories include how thermoelectrics is cooling night vision goggles, how proximity sensors enable a touchbook, how saucy algorithms cracks code, how quantum entanglement clarifies images and who won Challenge X. Also get a preview of this weekend's Bourne Report. 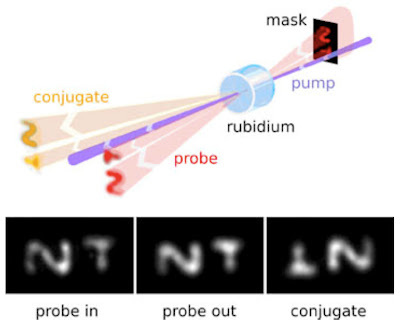 "QUANTUM: Quantum-entangled images show hidden details"
Quantum-entangled images--two randomly fluctuating pictures separated in space but inextricably linked through their complementary features--have been captured in real-time for the first time. The advance was achieved at the Joint Quantum Institute (JQI, College Park, Md.) by a joint research team from the National Institute of Standards and Technology and the University of Maryland. The new method, which is said to be simple to implement compared to earlier attempts, reveals new details in hard-to-see objects. 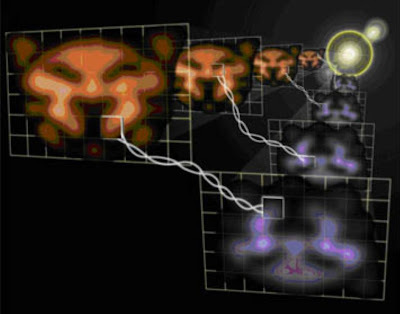 The researchers also generated reams of entangled data that prove useful in future quantum computers, according to JQI researchers Paul Lett and Vincent Boyer. "ALGORITHMS: Saucy algorithm exploits symmetries"
Combinatorial problems are one of the toughest nuts to crack in design automation and other applications that sift data. For instance, the number of Internet router path combinations for sending a message around the world is enormous. The shortest path is seldom chosen because there is no way to find the optimal distance among so many possibilities. Now, the developers of an algorithm called "Saucy" claim it can solve such problems quickly by finding symmetries among large swaths of possibilities. In the global Internet routing problem, Saucy found so many symmetries--10 with 83,687 zeros--that it could sort through and an find an optimum path in under a second. 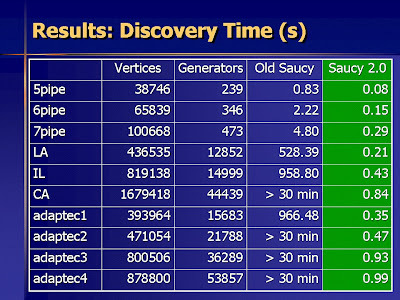 Saucy was described this week at the Design Automation Conference. "ALGORITHMS: Electronic TouchBook debuts at Sensor Expo"
Cincinnati-based Somatic Digital unveiled an eTouchBook at this week's (June 9-11) at the Sensors Expo in Rosemont, Ill. The touch-sensitive book technology combines printed pages with an electronic binding that provides touch sensitivity. Touching the book with a finger activates hyperlinks to Internet resources which then appear on a connected computer. Available for license to book publishers, the eTouchBook has been chosen by such customers as NASA's Goddard Space Flight Center. The electronic book binds printed pages into a plastic shell serving as the book's cover as well as housing its electronics. A USB connector in the book's binding allows it to be connected to a computer. 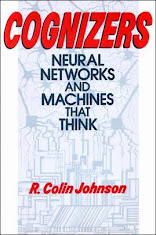 As readers turn pages, they touch illustrations or other hyperlinks to activate a universal resource locator, which is sent via the USB cable to the computer for display of associated content. "ENERGY: Mississippi State team wins 'green' car design competition"
A Mississippi State University team has won the Challenge X auto fuel-efficiency competition sponsored by the U.S. Energy Department and General Motors. The Challenge X competition aims to design the world's most fuel efficient car--in this case a Chevrolet Equinox. GM donated cars and Freescale Semiconductor donated almost $2 million in development boards, Power Architecture processors and software. "MATERIALS: Thermoelectrics cool night vision goggles"
Infrared night vision goggles used by the U.S. military are limited by thermally-generated noise in indium gallium arsenide (InGaAs) infrared sensors. Nextreme Thermal Solutions Inc. (Durham, N.C.) and infrared sensor maker Princeton Lightwave Inc. (PLI, Cranbury, N..J.) have used thermal bump technology to cool a short-wave infrared InGaAs focal plane array thereby clarifying its images. Unlike current sensors, PLI's focal plane array utilizes the 1.6-micron wavelength, which enables the use of laser illuminators that are invisible to current night vision goggles. "SLIDESHOW: Week-in-Review, June 6, 2008"
View a slideshow version of this week's top technology stories, which include how IBM water cools 3D chip stacks, how a foundry is offering nanotube-chip fabrication, how quantum measurements could cool chips, how Dolby Volume levels consumer devices, and how Taiwan is set to go WiMAX. "PODCAST: Week-in-Review, June 6, 2008"
Here I review the week's tops stories as compiled from interviews I do for EETimes. This week our top stories include how to water cool 3D chip stacks, how a foundry is offering nanotube-chip fabrication, how quantum measurements could cool chips, how Dolby Volume levels consumer devices, and how Taiwan is set to go WiMAX. Also get a summary of this week's MEMS Ahead blog and a sneak preview of this weekend's Bourne report. "CHIPS: IBM water cools 3D chip stacks"
IBM's Zurich Research Laboratory demonstrated three-dimensional chip stacks that are cooled with water, which the company expects to commercialize for its multicore servers. By stacking memory chips between processor cores they can multiply interconnections by 100 times while reducing their feature size tenfold. 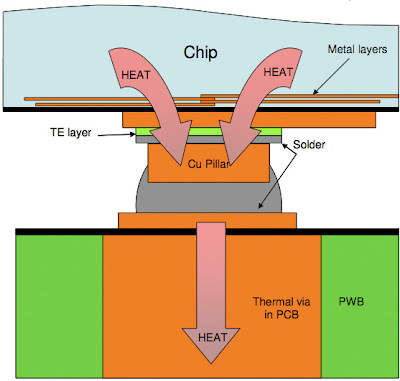 To cool the stack at a rate of 180 watts per layer, water flows down 50-micron channels between the stacked chips. Earlier this year, the same group described the water cooling method for IBM's Hydro-Cluster supercomputer. 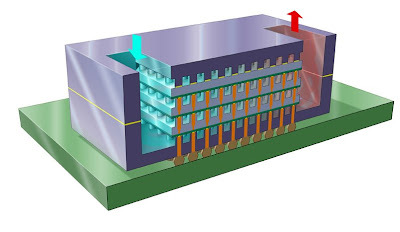 The Zurich team predicts high-end IBM multicore computers will migrate from the copper-plate water-cooling-method to the 3-D chip-stack in five to 10 years. "WIRELESS: WiMax field trials set for Taiwan"
Global Mobile Corp. of Taipei announced that it plans to begin WiMax field trials in Taiwan. Along with partner NextWave Wireless Inc. (San Diego), Global Mobile's Taiwan WiMax network will offer a service called MXtv, with up to 40 live-broadcast channels, as well as with interactive media services, digital audio, video conferencing, and voice-over-IP. WiMax subscribers in Taiwan would communicate with cell towers using NextWave's V5 basestations and gateway platform running software provided by PacketVideo, a NextWave subsidiary delivering 3G mobile TV in Europe. "QUANTUM: Measuring could yield new chip-cooling scheme"
Scientists take great pains not to disturb the coherence of quantum states through constant measurements. Israeli and German scientists recently collaborated to turn this technique on its head, using the measurement of quantum states to control thermodynamics (temperature) and entropy (settling). The scientists claim that in two-level quantum systems--like those used to represent quantum bits (q-bits)--the frequency with which they are measured controls both temperature and entropy. The approach could enable novel cooling schemes as well as instant-settling for atomic, molecular and solid-state devices. Both cooling and state purification, they claim, can be made to occur much more quickly than the normal time typically needed to achieve thermal equilibrium for cooling or feedback around a control loop for purification. "ALGORITHMS: Dolby Volume turns up on Symphony DSPs"
Banking on Dolby Volume's becoming as common as Dolby Digital surround sound, Freescale Semiconductor Inc. has built the technology into its entire line of Symphony digital signal processors (DSPs). 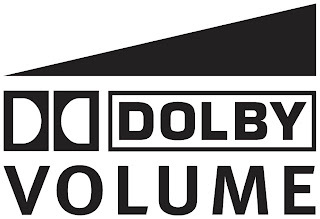 Dolby Volume turns up quiet programs, muffles loud advertisements and generally equalizes sound levels among different audio sources, such as DVD and TV. Earlier this year, Cirrus Logic Inc. (Austin) introduced an audio DSP with Dolby Volume sound-leveling technology, but only for stereo digital TV applications. 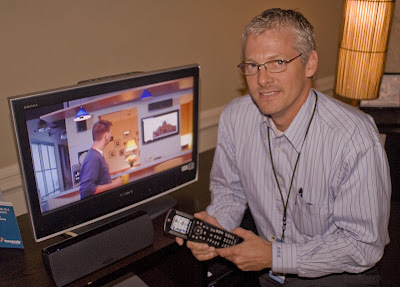 Freescale's DSPs implement both stereo DTV and full multispeaker surround sound systems for home theaters. "NANOTECH: Nanotube fab gears up for production"
Carbon nanotube chips appear ready for commercialization, claims the first foundry offering carbon nanotube thin films to fabless chip makers. Nantero Inc. (Woburn, Mass.) partnered with SVTC Technologies (Austin, Texas) to offer the first eight-inch nanotube thin-film development foundry. SVTC uses Natero's process to prototype commercial CMOS carbon nanotube designs for fabless chip houses. SVTC said its first customer is prototyping a carbon nanotube-based random-access memory (NRAM). Nantero claims NRAMs could be up to 20 times denser than current flash memories using 22-nm square bit cells compared to 100-nm cells for current 16-Gbit flash memories. That's a whopping 320-Gbit/chip densities for NRAM using current lithography. Using next generation lithography, Nantero claims nanotube thin films could ultimately be capable of terabit-per-chip capacities by squeezing bit cells down to as small as 5-nm square. Besides NRAMs, carbon nanotube films are good candidates for applications like interconnection layers below the 45-nm process node where carbon nanotube thin films may outperform copper interconnects. The films also could be used to make cheap, durable touch screens, replacing indium tin oxide in flat panels for electron-field-emission displays. 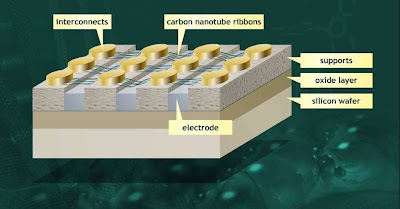 Other proposed applications include paper-thin batteries, super-efficient solar cells and for ultra-sensitive sensors.